Earlier in the winter when I hashed out a plan to race my Mini Transat next year in the Bermuda 1-2 Yacht Race, my wife said, "If you're gonna sail to Bermuda solo, you might as well do it once more crewed." Smart. So I signed up as part of the crew of the Swan 56, King Daddy. Later this morning, we'll drop the dock lines at the slip in Jamestown, RI, and head out to the start of the biennial classic--the Newport Bermuda Race, which is fondly known as as the Thrash to the Onion Patch. Fun fact: Settlers from England first introduced onions to Bermuda in 1616. The racetrack for Newport Bermuda is virtually the same as the Bermuda 1-2: 635 miles at approximately 162 degrees magnetic. However, because the Gulf Stream current--the major obstacle between Newport and Dark 'n Stormies at the Royal Bermuda Yacht Club--is constantly changing, each crossing can be vastly different. This year, the current is shaping up to deliver three significant eddies according to our intel from Jennifer Clark: one warm eddy (clockwise current) straddling the rhumb line north of the stream; and two cold eddies (counter-clockwise current) south and to the west of the Stream--one large and one small. These eddies will serve as conveyor belts. Get on the correct side, and you'll get a bump to Bermuda at around two to four knots. Get on the wrong side, and, well, suffer the consequences. The goal on King Daddy is to push through what is forecast to be relatively light breeze for the first two days to get to the first eddy and then break right, cross the Stream, and get to the western side of the next eddy, which is estimated to deliver a four-knot current. Staying west is essential not simply because of the favorable eddies that exist on that side of the rhumb line, but because of the low pressure weather system that is forecast to pass over the racetrack on Sunday. This system is expected to bring a fresh SW breeze of between 15 and 25 knots. If we can get out in front of that system and far enough west of the rhumb line, we'll be able to catch a nice reach to Bermuda. Punching through the first bout of light air is going to be tough as King Daddy is very heavy, is carrying a crew of 16 (and necessary food and water for three days at sea), and generally hates light-air downwind sailing. That said, the boat has been optimized to prevail in the St. David's Lighthouse (amateur) division of the race. I like to joke that race-optimized means we don't run the AC when the racing sails are up! 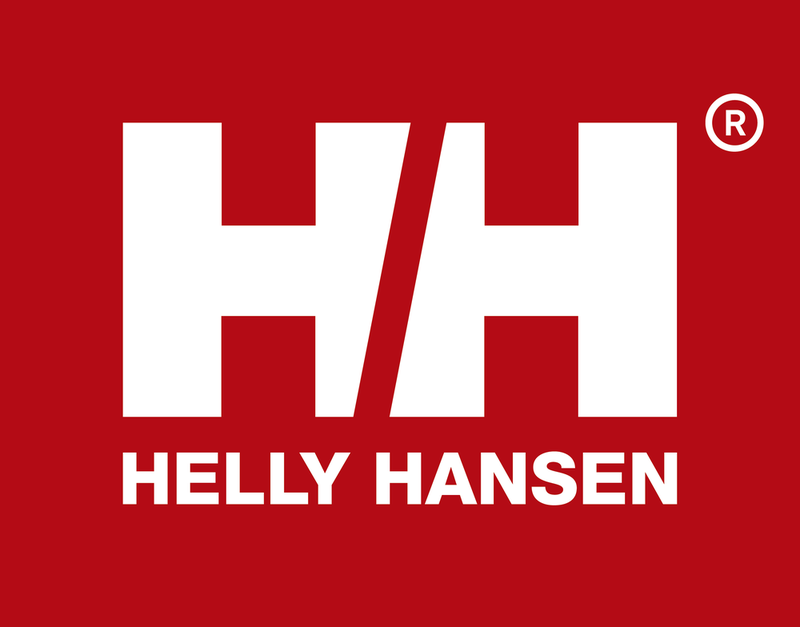 But, in point of fact, the owner and boat captain have made tremendous efforts to make the boat competitive, including by stripping all unnecessary weight, replacing the aluminum spars with carbon, and of course decking the crew out in a full kit of Helly Hansen performance sailing gear. On top of dedicating substantial resources to getting the boat itself ready for the race, the owner and boat captain have also pulled together a crack team of amateur and professional sailors with substantial racing experience, both offshore and around the buoys. Rounding out the 13 amateur (Cat 1) sailors, including myself, are three pros: Gregg Griffin, Jack Slattery, and Pat O'Connor. Gregg previously sailed with Privateer, a Cookson 50, and is cutting his teeth as boat captain aboard King Daddy. 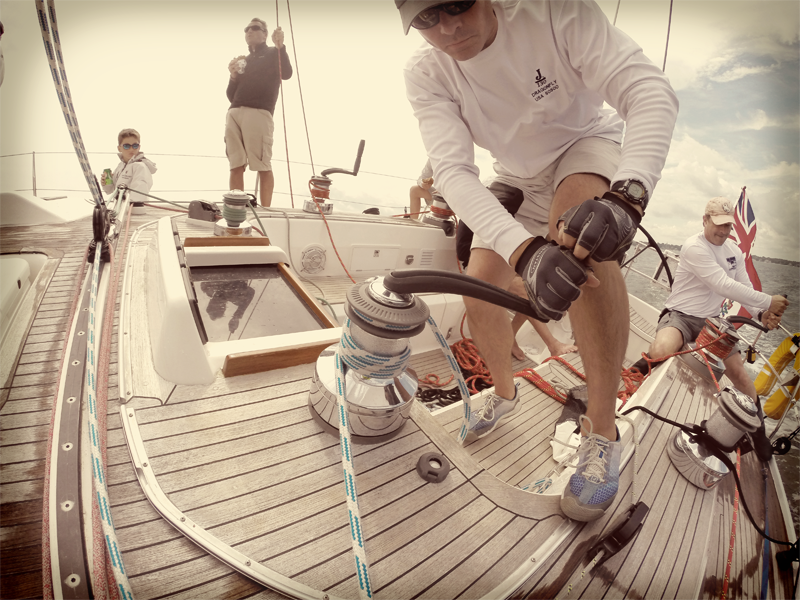 Jack is a sales manager at North Sails in Salem, MA, and has over 20 Newport Bermudas under his belt. 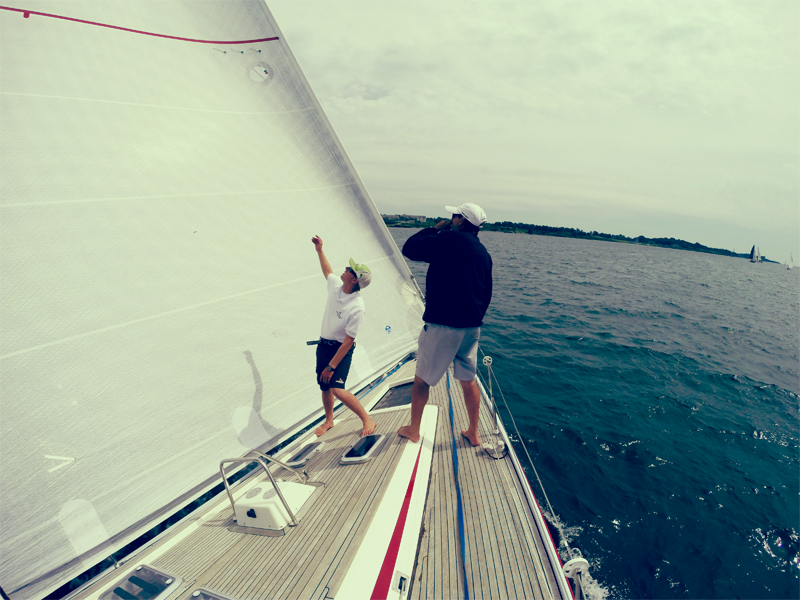 Jack has coached the NYYC entry in the 2013 and 2011 NYYC Invitational Cup regattas. Lastly, Pat came aboard from previously sailing with Spookie, Catapult, and a host of other high-performance race programs to serve as our second bowman. 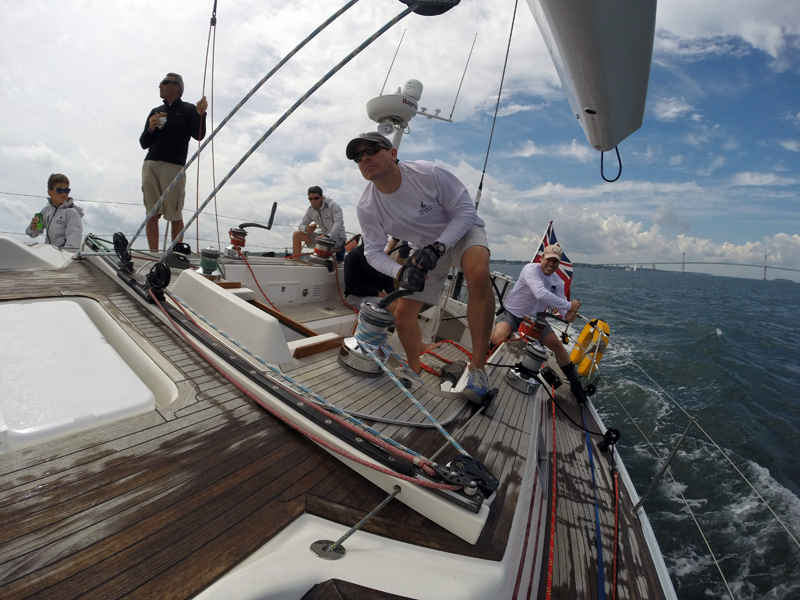 King Daddy and her crew have been up in Newport, RI since Tuesday staging the boat for the race. We've tested all the sails, practiced safety procedures like man-overboard and the mechanics of setting the storm jib and storm trysail, checked the rig (and checked it again), and packed the massive kites into launching socks. As we come down to the wire, we'll calibrate our instruments with the assistance of Jeff Udell at Custom Offshore and say goodbye to Newport as we hit the start line with 162 other boats spread across 14 classes under what looks like to be a perfectly azure sky. Wish us luck and track us here. Official race documents, including the scratch sheet, can be found here.